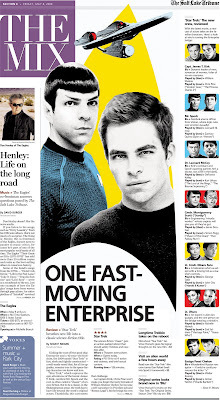 This page I designed is from last Friday, when Star Trek came out. I had a lot of fun manipulating the hand out art and creating the pictures for the character profiles. As far as the movie goes, even if you've never watched Star Trek, you might just like this one. I highly recommend it. I've been meaning to post about this for a couple of weeks now, but keep forgetting to. 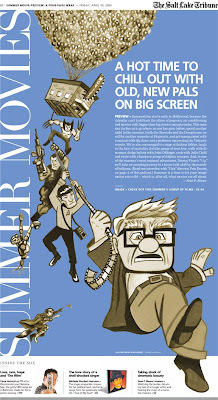 This is the cover to this years Summer Movie Preview for The Salt Lake Tribune. As always, since I love the summer movie season, I love putting together this section and making it look great. 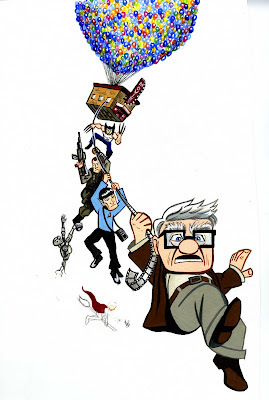 This year, our film critic Sean Means got an interview with Pete Doctor, the co-director of Pixar's "Up" so I decided to play off of the main poster to tie together some of the other movies coming out. Even though making it look monochromatic was an idea I had before executing it, I decided to go ahead and paint it in full color with gouche, just to see what it would look like in case I liked it better. I made sure that I kept the values light enough so I could make it monochromatic in Photoshop later. After several dry runs, we all decided that the sepia version would not only print better, but would look better and be different. The single color really carries your eye through the illustration much better than had I gone with the final color version.